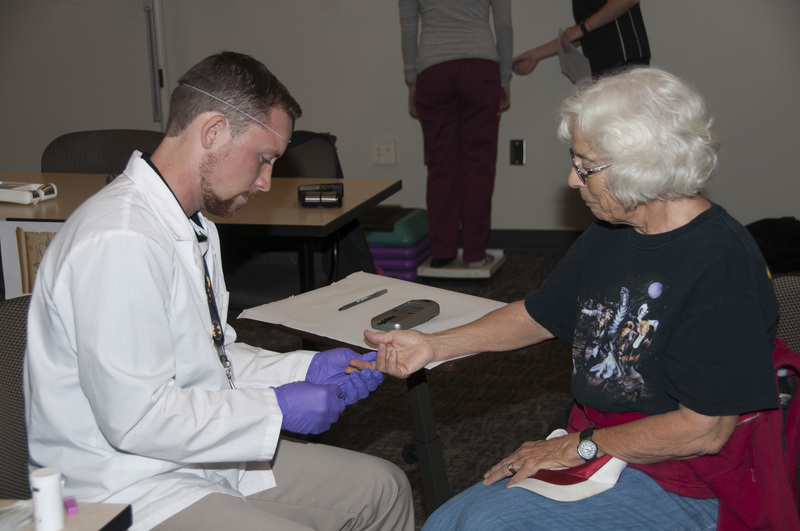 The event – put on by the Nutrition and Exercise Physiology (NEP) program and the Campus Wellness Collaborative – gave students experience in providing the type of health care that they will provide when they graduate. Pharmacy students gave flu shots (for free! ), NEP students conducted health assessments and tested cholesterol, and nursing students checked blood glucose levels. Students and attendees also had the chance to tour exhibits from health-related companies, organizations and clubs in our area. NEP, pharmacy and nursing students worked together to provide health care to the fair’s attendees. In the working world, the students will encounter this inter-professional approach. For example, the pharmacy students were giving flu shots – not providing medications. In many communities, pharmacists are seen as the town’s main health provider because they can give flu shots and more. Understanding how each profession works helps these students. What good is a health sciences degree without any real world experience? Students were able to give flu shots and more to actual human beings. Reading about it in a book and practicing on a mannequin are still essential, but learning by doing is just as important. This community has given WSU Spokane and its students a lot – a beautiful campus, support at the local and state level – so serving the community at this event was another good experience for the students.